On Friday, I attended an especially lively and fun Beard House dinner, full of fizz and crackle. If you've never been to one of these West 12th Street extravaganzas, imagine the book-lined library of a Victorian eccentric who was also partial to mirrored surfaces and pineapple-patterned wallpaper. Then imagine that room crammed with tables, each place setting packed with so many wine glasses and pieces of silverware that you feel like you're at a tableware trade show. That's what dinner at the townhouse once inhabited by American culinary icon James Beard feels like. What made the night so special were our hosts, paragons of hospitality Adam and Stacy Jed, owners of Bluestem Brasserie in San Francisco, and the dinner that their gifted kitchen team, headed by chef Francis Hogan and pastry chef James Ormsby, sent out. It was a perfect, mild summer evening for drinks and hors d'oeuvres in the garden, and the restaurant's signature Bluestem Smash cocktail, made with St. Germain, vodka, seasonal fruit, mint, lime and sparkling wine, provided the aforementioned fizz. 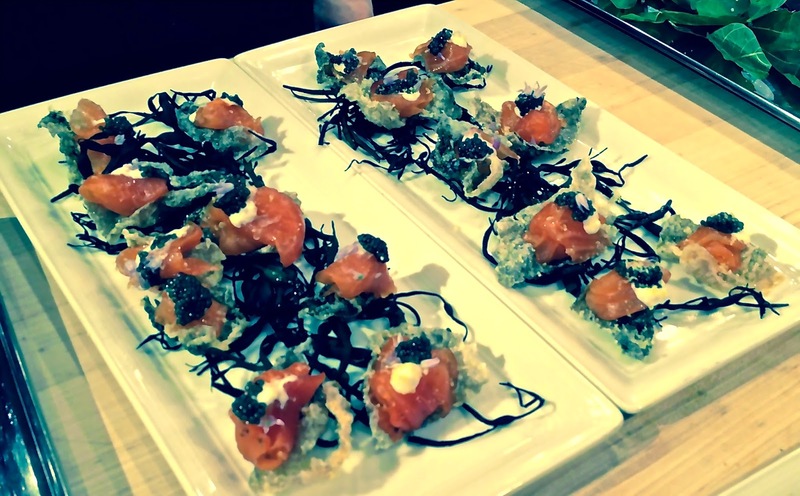 The first crackle came courtesy of morsels of smoked salmon belly, paddlefish caviar, and crème fraîche on, yes, cracklings of salmon skin. The other notable crunch of the night came on the outer edges of a cleverly conceived dish of slow-cooked Fallon Hills Ranch lamb belly. Like many dishes at Bluestem, this one was inspired by the self-imposed challenge of grass-fed, nose-to-tail whole-animal cooking. When four lambs and two pigs a week are delivered to your kitchen, as they are at Bluestem, what do you do with off cuts that other kitchens might discard? If you're Hogan, you stack lamb bellies six at a time, rubbing them with olive oil, sea salt and rosemary, then slow cook the pressed blocks for twenty-four hours. Lamb belly, he explained, is not fatty like that of pork, and only about three-quarters of a centimeter thick. Yet prepared his way and served with a blueberry agrodolce, preserved citrus yogurt and Douglas fir pine-scented Himalayan red rice, the layered, geological-looking lamb belly tasted just a succulent as its porcine counterpart. I also liked the playful sweet-savory desserts that Hogan and Ormsby came up with. The first was a play on milk and cookies with a trio of goat and sheep's milk cheeses from Pennyroyal Farm in Mendocino sitting in for the milk. A chocolate shortbread Oreo-style cookie was filled with a whipped chevre-style Laychee and red wine-soaked cherries; a plush-rinded camembert-style cheese called Velvet Sister came balanced atop a crispy cornmeal biscotti made with a grassy olive oil, and a mission fig-filled shortbread accompanied a nutty aged goat and sheep's milk cheese called Boont Corners. Hogan was so happy to be in a state where it's legal to purchase foie gras, that he requested that Ormsby build a second savory-sweet dessert around a torchon of Hudson Valley Foie Gras. He created a"PB and J" constructed of toasted, vanilla-soaked brioche, a peanut-cocoa nib tuile, caramelized white chocolate ganache and the disc of foie gras. Asked what the difference was between cooking on the West Coast compared to our side of the country, Hogan who grew up in New Jersey and has cooked in restaurants in Philadelphia and Seattle as well, said, "The East Coast is more technique driven, and the West Coast is more ingredient driven--you can source so locally in San Francisco." Grrr. But we have the beauty of the changing seasons here, right? Appetite whetted for all that hyper-local sourcing, I'm counting the weeks before I can make another trip to the Bay Area.